live—deserves access to quality health care. Those first graduates have been essential to NOSM becoming rooted in the North. 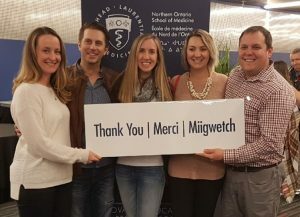 In the ten years since they graduated, some have chosen to serve Northern Ontario communities where they grew up, or that embraced them as medical students and residents. Many NOSM graduates continue to be involved in the School as faculty, administrators and board members, working with us to improve the health of Northern Ontarians. NOSM students and graduates are making a difference every day in the health of communities across Northern Ontario. Your support makes that happen. You are having an impact on our students, our gradates, our communities. Over the past thirteen years, NOSM has taken root in the North. 94% of NOSM graduates who have completed both their MD and residency programs at NOSM are now practising in Northern Ontario. 92% of NOSM MD students are from Northern Ontario. The remaining 8% are from other rural and remote areas of Canada. There have been 595 MD graduates from NOSM since 2009. Since 2007, 135 Registered Dietitians have graduated from NOSM’s Northern Ontario Dietetic Internship Program. Since 2011, 194 NOSM-educated family physicians now practice in Northern Ontario, which translates to better access to care for approximately 228,000 Northern Ontarians.